The Church of Jesus Christ is an international and independent Christian religious denomination headquartered in Monongahela, Pennsylvania, United States. The Church of Jesus Christ is a Christian Restorationist church and is historically part of the Latter Day Saint movement. The church considers itself the Gospel Restored, or the original church and good news as established by Jesus Christ in the New Testament, restored upon the earth. It also claims to be the spiritual successor to the Church of Christ, organized by Joseph Smith on April 6, 1830. The church sees Sidney Rigdon as Smith's rightful successor following the assassination of Smith because Rigdon was Smith's first counselor in the First Presidency. The church is not officially affiliated with any other church, organization or denomination. As of July 2018, members are located throughout the world including North and South America, Europe, Asia and Africa—for a membership total of 23,197. The Church of Jesus Christ is considered "the third largest Restoration church to have resulted from the 1844 succession crisis". It has sometimes been referred to as a "Bickertonite church" or "Rigdonite organization" based upon the church's historical succession through William Bickerton and Sidney Rigdon. The church does not use these terms in referring to itself. Church members call each other "Brother" or "Sister" as individuals and collectively as "Saints", considering themselves part of the family of God. The stated purpose of the church is "to share the gift of salvation through Jesus Christ, His promises and His redeeming love with all nations and races throughout the world and to carry out God’s plans in the latter days." The Church of Jesus Christ's historic chapel in Monongahela, Pennsylvania. "The Church of Jesus Christ will teach the Gospel to all nations baptizing them in the name of the Father, and of the Son, and of the Holy Ghost; teaching them to observe all things commanded by Jesus Christ. "To draw Israel to Christ through an effort focused on the Native Americans of North and South America." "To fulfill the plan of God by bringing salvation through Christ to all people." "The full manifestations of God's Spirit and power among the Saints, resulting from living and worshiping in unity and righteousness, stimulate continuous growth of the Domestic Church – even at a rate of doubling over a five year period – while strengthening the International Church." The church is sometimes referred to as a "Bickertonite" or "Rigdonite" organization by non-members. These terms have reference to the church tracing its historical succession through William Bickerton and Sidney Rigdon. The use of these terms are discouraged by the church as detracting from Jesus Christ. Although the church acknowledges the Book of Mormon to be scripture, it does not consider itself to be a "Mormon church" as it views itself distinct from the largest Latter-day Saint church, based in Utah (which has trademarked the term, "Mormon",  though it now discourages the use of that name for itself). The Church of Jesus Christ sees itself as a continuation of the Church of Christ, which was the original church organization established by Joseph Smith informally in 1829 and then as a legal entity on April 6, 1830 in northwestern New York. On April 6, 1830, Smith, Oliver Cowdery, and a group of approximately 30 believers met to formally organize the Church of Christ into a legal institution. Traditionally, this is said to have occurred at the home of Peter Whitmer, Sr. in Fayette, New York, but some early accounts place it in Manchester. Soon after this formal organization, small branches were formally established in Fayette, Manchester and Colesville. Smith and his associates intended that the Church of Christ would be a restoration of the 1st-century Christian church, which Smith taught had fallen from God's favor and authority because of a Great Apostasy. In late 1830, Smith envisioned a "city of Zion" in Native American lands near Independence, Missouri. In October 1830, he sent his second-in-command Oliver Cowdery and others on a mission to the area. Passing through Kirtland, Ohio, the missionaries converted a congregation of Disciples of Christ led by Sidney Rigdon, and in 1831, Smith decided to temporarily move his followers to Kirtland until the Missouri area could be colonized. The church headquarters remained in Kirtland from 1831 to 1838. Many of Smith's followers attempted to colonize Missouri throughout the 1830s, and Smith himself moved there in 1838. The church faced political and military opposition by other Missouri settlers. After a series of crises, the church then established its new headquarters in Nauvoo, Illinois, a city they built on drained swampland by the Mississippi River, where Smith served as mayor. There, the church thrived until Smith and his brother Hyrum were killed by a mob in 1844. They were in prison awaiting trial for crimes related to the destruction of the printing press of the Nauvoo Expositor. At the time, Smith was a minor candidate for President of the United States with Rigdon as his running mate. After Smith was killed in 1844, there was confusion about who should succeed him in leading the church. Many of the leaders of the church were absent from Nauvoo at the time of his death, serving as missionaries or working on Smith's presidential campaign. Rigdon was in Pittsburgh, Pennsylvania, when he heard of Smith's death, and hurried back to Nauvoo, becoming one of the first church leaders to return. He quickly announced that he had the right to lead the church as its "guardian" until proper proceedings could decide the next church president, and that the Quorum of the Twelve did not have the right to lead the church. Rigdon, like the Twelve, had been ordained by Smith as a "prophet, seer, and revelator". The Church of Jesus Christ maintains that the First Presidency had made nearly all the major decisions and led the Church of Christ prior to Smith's death, and as first counselor to Smith at the time of Smith's death, Rigdon should naturally have been the leader of the church after Smith's death. Bickerton continued to preach and by May 1851 a branch of the church was organized under Bickerton's leadership in West Elizabeth, Pennsylvania. At a conference on July 9, 1861, it was recorded that twelve of their number were chosen and called by the Holy Spirit to be apostles. 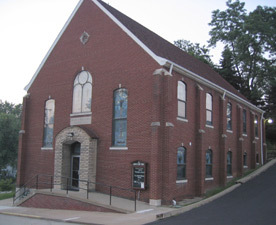 The church was incorporated in Pittsburgh in June 1865 with the legal name, "Church of Jesus Christ of Green Oak, Pennsylvania." On April 5, 1941, the church was granted the name of "The Church of Jesus Christ" by Washington County, Pennsylvania. The church today is registered as "The Church of Jesus Christ" in the corporate registry of the state of Pennsylvania. The Church of Jesus Christ is organized with 12 Apostles, 70 Evangelists (see Quorum of Seventy Evangelists), and Elders as ordained offices within the general priesthood or ministry. Teachers, deacons and deaconesses are also ordained offices within the church but not part of the general priesthood. The church structures itself as closely as possible to the New Testament church according to the 4th and 5th articles of the Faith and Doctrine of The Church of Jesus Christ. The church presidency is composed of Apostles including the president of the church, first and second counselors. The president of the church and his two counselors are elected by the general priesthood in conference and selected from among the Quorum of Twelve Apostles. The president of the church, while being an ordained apostle, functions as the chief operating officer, overseeing the general operations of the church. In contrast, the Quorum of Twelve Apostles has its own president and officers elected among themselves, independent of the general priesthood. The Quorum of Twelve is primarily responsible for guiding the spiritual growth and development of the church in general, acting as advisers to key operating committees. Today, The Church of Jesus Christ has a total worldwide membership of 23,200, with nearly 3,000 located in the United States. The church continues to experience significant growth in comparison to some of the other smaller Latter Day Saint organizations. Within the last decade, it has been engaged in the construction of new church buildings in Michigan, Ohio, Pennsylvania, Florida, California, New Jersey, and Arizona, along with similar construction efforts in many foreign countries. The Church of Jesus Christ is independent of any other church in the Latter Day Saint movement. The Church of Jesus Christ has long rejected plural marriage, celestial marriage, two separate priesthoods, and many other doctrines taught by some other Latter Day Saint movement denominations. The Church of Jesus Christ teaches that many of the doctrines and revelations Joseph Smith taught were not from God and were contrary to the Bible and the Book of Mormon. The church also teaches that many of the Latter Day Saint denominations fell into error by following these revelations. The Church of Jesus Christ views the nature of God as explained in the Bible and Book of Mormon, which the church distinguishes from the views taught by The Church of Jesus Christ of Latter-day Saints. Godhead: The Church of Jesus Christ believes, "...in God, the Eternal Father, and His Son, Jesus Christ, and the Holy Spirit. These three are the great matchless power that rules all things visible and invisible, for it is of Him and through Him that we receive all things both for this life, and that which is to come." God the Father: God the Father, or God Almighty, is believed to be a personage of Glory. Jesus Christ: Jesus Christ is the Son of God, the "...express image of the Father..." who "...came from the bosom of the Father, was born of the Virgin Mary...became man and suffered and died for the sins of the whole world." The church believes in the physical life, crucifixion, resurrection and ascension of Jesus Christ who they believe now sits at the right hand of God the Father. Holy Spirit: The Holy Spirit is considered to be a spirit and the very mind of the Father and the Son. He is not considered to be a personage itself, but can take upon himself many forms. "God, through His spirit, can be everywhere. He can observe and penetrate any part of the universe of His creation. This does not mean that God is physically everywhere, but His spirit, which is in communication with all things at all times, is everywhere. It is like the fragrance of a beautiful bouquet of flowers that permeates an entire house, although it is only in one room." It is considered to be the Power, Glory and Witness as referenced in New Testament Scriptures. The Church of Jesus Christ teaches that the church as set by Christ in the New Testament contains all doctrines and practices essential for salvation. Adherents believe that the church today should contain every element of the early church. Humankind will be punished according to their own sins and not the sins of Adam and Eve. Little children, therefore, have no need of baptism to obtain salvation, as they are without sin, and are commonly blessed by the priesthood. Young people are permitted to join the church when they reach an age of accountability. Faith – Members must believe in Jesus Christ, that He died and was resurrected. Repentance – A feeling of sorrow for sin and desire to sin no more. Baptism (Water) – Done by immersion in water in the name of the Father, Son, and Holy Ghost for the remission of sins. Immersion is considered being buried in likeness of the death of Christ and arising in newness of life. The church teaches that baptism must be in a natural body of water such as a river or lake, and not in a pool or other artificial structure. Baptism (Fire) – Laying on of hands to receive the Holy Ghost. The priesthood lay hands on the head of the candidate for this reception after the baptism of water. The Church of Jesus Christ teaches that the structure of the early church and that apostles, evangelists, elders, teachers, and deacons should still lead the church today. The most important calling within the church is considered to be that of a member. The leadership is not considered a hierarchy, but rather the higher the calling the greater the service. Each leadership position within the church further adds to the service required. No office within the church is paid, including the ministry. Apostles lead the church; evangelists preach to the world; elders serve their various branches and missions. All of these offices are considered the "ministry" of the church. Teachers visit the membership, teach, and preach or lead services when elders are not present. Deacons visit the sick, widows, and attend to many physical and spiritual duties for each branch of the church. Deaconesses set the sacrament table and attend to the needs and development of the women of the church. Evangelist anointing with oil in Kenya, Africa. Although women may serve as deaconesses in the church, in accordance with the church's interpretation of the scriptures, only men may become elders. Deaconesses do not have priesthood authority but prepare the communion tables. Deacons set up chairs and prepare the chapel for meetings; they also care for the members of the church in general and visit the sick in particular. Elders are responsible for the spiritual well-being of the church. As with most Restoration denominations, elders are never referred to as "Father" or "Reverend", as the belief of the church is that scripture forbids this practice (Matthew 23:9). Likewise, elders and all church officials (including the Church Presidency and Quorum of Apostles) are volunteers and receive no financial remuneration for their activities. Elders perform administration to the sick through the laying on of hands, using oil if the illness is physical. According to the doctrine of the church, elders, evangelists, and apostles are called to their positions by revelation. In worship services, members of the priesthood do not prepare written sermons prior to the meeting. Instead, the priesthood strives to speak under the inspiration from the Holy Spirit. Each week, church services begin with preaching from the priesthood and generally followed by a testimony portion of the meeting, during which time members of the congregation (and visitors) are given the opportunity to "praise God for what He has done for them." The Church of Jesus Christ considers Joseph Smith to have been a prophet and a seer, and an instrument in the hands of God in the restoration of the gospel. The Church of Jesus Christ believes that many revelations began to enter into the church through Smith that were contrary to the scriptures and the will of God. In contrast with other Latter Day Saint denominations, the church does not believe that Smith was the "Choice Seer" predicted by the Book of Mormon (2 Nephi 3:6-7). Its members are still awaiting the coming of the Choice Seer whom many in the organization believe will be of Native American heritage. "There has been much said about Joseph Smith .... [A]ll people who manifest faith in the Restored Gospel of Jesus Christ, which includes the coming forth of the Book of Mormon, do acknowledge him to be inspired of God when but a youth .... He has been a much accused man, whether truly or falsely, eternity will reveal. If he taught plural marriage ... plural Gods, baptism for the dead, the Book of Mormon does not sustain him, neither does the teachings of our Savior in the New Testament .... The Church of Jesus Christ does not believe such teachings." Members of The Church of Jesus Christ perform many ordinances as found in the New Testament and the Book of Mormon. Baptism, the Lord's Supper, feet washing, and others are all ways to remember Jesus Christ. The church claims these ordinances demonstrate remembrance, love, and humility before God and each other. Like many Christian denominations, the church uses bread and wine for the Lord's Supper, which represents the body and blood of Christ, which it believes was sacrificed for the sins of humankind. Some congregations choose to read the communion prayers verbatim from the Book of Mormon (Moroni 4 and Moroni 5), while most congregations follow the "inspiration of the Holy Spirit" for the communion prayers. A first prayer is given prior to passing the bread and then another is offered prior to passing the wine. The communion is administered only to active, baptized members of the church. The wine is served in a communal cup. The ministers serve the congregation by walking around to each person in their seats, first with plate of bread and then with the cup of wine. The bread is not wafers or crackers, but leavened bread that has been broken into small pieces by the ministry during the ordinance. The ministers are the last to partake of the bread and the wine after the congregation has been served. Church members follow the ordinance of feet washing (John 13:5) four times a year as a demonstration of personal humility. The church believes that this is a very important ordinance, citing Jesus' statement to Peter: "If I wash thee not, thou hast no part with me." Church members greet each other with a "holy kiss", preferably on the cheek, to signify that they are greeting each other in the love of God, in accordance with the description given in the King James Version of the New Testament. Members of the church believe in the gifts of the Spirit, as described in their scriptures. These include but are not limited to: the word of wisdom, the word of knowledge, faith, healing, prophecy, discernment, witnessing of angels, speaking in tongues, and the interpretation of divers tongues. Members of the church refer to each other as "Brother" and "Sister." The church counsels members to be moderate in all things including their dress and appearance. The church believes that serving God and following Jesus is a "365 day per year activity", not just a Sunday activity. Chapels of the church do not contain altars, crosses or pictures, as they believe scripture forbids any type of "graven image, or any likeness of anything that is in heaven above, or that is in the earth beneath, or that is in the water under the earth" (Exodus 20:4-7). The Church of Jesus Christ teaches that hymns are often revealed through divine inspiration for the edification of the church. The hymnal The Songs of Zion consists of hymns that were given to a church member, Arlene Lea Buffington, through divine inspiration. The church also uses The Saints Hymnal, which contains many hymns sung in traditional Christian churches as well as hymns of the restoration. Many congregations also use additional hymnals from other Christian organizations. The church maintains a publishing house in Greensburg, Pennsylvania and prints its own edition of the Book of Mormon. The church publishes a monthly periodical called The Gospel News. The Church of Jesus Christ has advocated full racial integration throughout all aspects of the church since its organization in 1862. While America disputed over civil liberties and racial segregation, the church directed its message towards all races. In 1905, the church suspended an elder for opposing the full integration of all races. At a time when racial segregation or discrimination was commonplace in most institutions throughout America, two of the most prominent leaders of The Church of Jesus Christ were African American. Apostle John Penn, member of the Quorum of Twelve from 1910 to 1955, conducted missionary work with many Italian Americans, and was often referred to as "The Italian's Doctor". Matthew Miller, an evangelist ordained in 1937, traveled throughout Canada establishing missions with Native Americans. Rock star Alice Cooper (born Vincent Damon Furnier) was raised in The Church of Jesus Christ, though he was never baptized. Cooper's grandfather, Thurman Furnier, was the president of the church from 1963 to 1965. ^ a b Registered corporate name in the Pennsylvania corporate registry. ^ a b c Valenti, Jerry (1986). "Volume 56". Welcome to The Church of Jesus Christ. Bridgewater, MI: Gospel News. p. 9. ^ a b c McKiernan, M.F. (1979). "Volume 56". The Voice of One Crying in the Wilderness: Sidney Rigdon, Religious Reformer. USA: Coronado Press. p. 9. ^ The Church of Jesus Christ General Business and Organization Conference Agenda. Greensburg, PA: The Church of Jesus Christ. 2018. p. 5494. ^ New President for Church of Jesus Christ (Bickerton) (PDF). The John Whitmer Historical Association. 2005. p. 13. Archived from the original (PDF) on 2010-09-23. ^ Pronounced /bikərtənaɪt/ , /rɪgdənaɪt/. ^ a b Calabrese, Joseph (1973). The Divine Continuity of The Church of Jesus Christ. Bridgewater, MI: The Church of Jesus Christ. ^ a b c "The Church of Jesus Christ – The Restored Gospel of Jesus Christ – Your Spiritual Home for a Faith-Centered Life". www.thechurchofjesuschrist.org. Retrieved 2015-10-07. ^ The Church of Jesus Christ FAQs: Q. If you believe in The Book of Mormon, doesn’t that make you a Mormon? A. If someone believes in the Old Testament, that does not automatically make that person a Jew. Similarly, if someone believes in the Bible, that does not mean that person is a Catholic. The Church of Jesus Christ has no connection whatsoever with the Mormon church. Further, many of the beliefs for which the Mormons are criticized are strictly prohibited by The Book of Mormon. We ask that any judgments of the Mormon church be put aside when evaluating The Book of Mormon." ^ Lovalvo, V James (1980). It is Written: Truth Shall Spring Forth Out of the Earth. Fresno, California: Midcal Publishers. p. 318. ^ a b c d A History of The Church of Jesus Christ: Volume 2. Monongahela, PA: The Church of Jesus Christ. 2002. ^ See, e.g., Donald E. Pitzer (1997). America's Communal Utopias (Chapel Hill: University of North Carolina Richard Press) p. 484; Howard, "William E. McLellin: 'Mormonism's Stormy Petrel'" in Roger D. Launius and Linda Thatcher (eds) (1998). Dissenters in Mormon History (Urbana: University of Illinois Press) pp. 76–101. ^ Bickerton, William (1975). William Bickerton's Testimony. Monongahela, PA: The Church of Jesus Christ. ^ a b c Cadman, William H. (1945). A History of the Church of Jesus Christ. Monongahela, PA: The Church of Jesus Christ. ^ a b c d e f Lovalvo, V. James (1986). A Dissertation on the Faith and Doctrine of The Church of Jesus Christ. Monongahela, Pennsylvania: The Church of Jesus Christ. Archived from the original (ZIP) on February 9, 2006. ^ Calabrese, Joseph (1977). Questions and Answers. Bridgewater, MI: The Church of Jesus Christ. ^ Bucci, Timothy Dom (2002). American Indian Moses. Naples, Florida. ^ Cowdery, Oliver (1839). Defense: In a Rehearsal of My Grounds for Separating Myself From the Latter Day Saints. Norton, Ohio: Pressley's Job Office. ^ a b Whitmer, David (2006). An Address To All Believers In Christ: By A Witness To The Divine Authenticity Of The Book Of Mormon. Independence, Missouri: Kessinger Publishing, LLC. p. 21. ^ Calabrese, Apostle Joseph (October 1994). "Gospel News". What is the Book of Mormon?. Bridgewater, MI: The Church of Jesus Christ. ^ a b c d Valenti, Jerry (2000). Welcome to The Church of Jesus Christ. Monongahela, Pa: The Church of Jesus Christ. ^ a b Valenti, Jerry (1986). "Volume 56". Welcome to The Church of Jesus Christ. Bridgewater, MI: Gospel News. p. 9. ^ Cooper, Alice; Gaines, Steven (1976). Me, Alice: the autobiography of Alice Cooper with Steven Gaines. Putnam. pp. 30 and 35. ISBN 0399115358. Retrieved 29 April 2015. My grandfather, Thurmond, and his wife, Birdie May, lived in Allentown, Pennsylvania, where Thurmond was a telegraph operator for the railroad in his spare time. In his full time he was a minister and president of the Church of Jesus Christ, which he presided over for sixty-three years until his death in 1974. ", "The church was suddenly everything to us, a religion, a social life, a new family. My father’s devotion was inspiring. ", "From then on I was in church with my father seven days a week! ", "We went to every sort of meeting and church conference or social even in the West.